Our outdoor aluminum furniture combines comfort and design to complement almost any casual or upscale décor. Made to withstand the natural elements, all of our outdoor aluminum chairs, tables, and bases feature anodized aluminum coatings to prevent corrosion. Durable welding also ensures maximum durability for years of service. Also make sure to check out other great items from BFM Seating, Flash Furniture and Grosfillex. 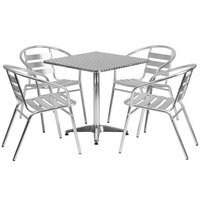 When you browse our outdoor aluminum furniture pieces, you’ll find chairs, table tops, and bases of all different sizes and heights. Choose from cocktail tables for your outdoor bar area, or go with dining tables for your bistro or café. The simple addition of an outdoor seating area is a great marketing tool and is sure to draw in many new and returning customers during the spring and summer months. You may also want to stock up on supplies, including non-skid trays, tray stands, and reusable plastic barware ! 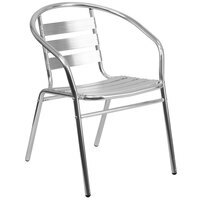 If you're wondering where to buy flash furniture outdoor aluminum furniture, we have a large selection of flash furniture outdoor aluminum furniture for sale at the lowest prices.